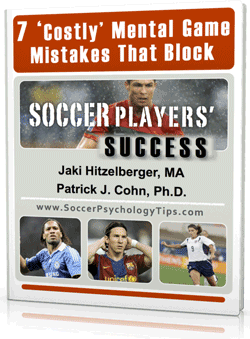 Many soccer players and soccer teams we work with hold themselves back with a comfort zone. What is a comfort zone in soccer? A comfort zone is a mental barrier that is based on what you (or your team) thinks you are capable of achieving or what you expect to achieve. 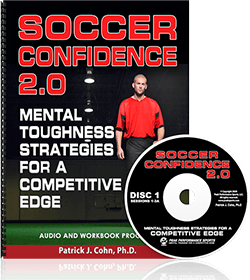 Comfort zones become a problem whenever a soccer player or team is playing better than expected or is in uncharted territory when competing. Comfort zones are usually developed from expectations based on past experience. For example, a soccer team may believe they can or cannot beat a certain team based on past seasons. One of our tasks as a mental game coach is to teach players and teams how to break free of comfort zones so they do not set limits on their performance. How Do You Know If a Comfort Zone is Affecting Your Performance? A common example in soccer is when you go up two goals on a team you have never beaten. You start to protect the lead and begin to hang back on defense, stop taking risks, and lose offensive momentum. Before you know it, your team is under so much pressure and can quickly lose momentum and the lead. 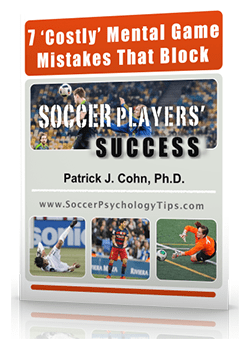 Our experience is that soccer players with specific performance expectations become tentative and overly focused on results when they are playing beyond these set limits. The best option is to play in the moment, avoid setting limits on your performance, and continue to press forward when reaching new heights. If this options fails and you begin to focus on how well you are performing or not losing the lead your team has, you should default to Plan B. Plan B is to accept that you are playing well and ride the wave of momentum. You need to refocus in order to take your mind off of results and back to what you need to do in the moment to continue to perform. If you experience comfort zones or other mental barriers to peak performance, contact us today to start your 1 on 1 soccer specific mental game coaching program. It definitely becomes an issue when dealing with a highly competitive team. Players walk onto the field half-defeated because they don’t think they have what it takes to win. Instead of stepping up and making that other team work for it, they accept the lose before it’s even happened!